The film is based on Ransome's book, but the script incorporates many changes in the plot. It chronicles the story of Walker children on their holidays in the Lake District. They want to camp on an island in the lake. 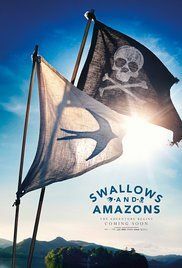 When they get there in the boat "Swallow", they soon discover they’re not alone. Two other children, the Blacketts also known as the "Amazons", have set up camp there, and a battle for the island begins. But with Britain on the brink of war and a "secret agent" looking for the Blackett children's uncle, they have a series of adventures quite different from their plans. Read more on Wikipedia.